Sturdily bound set of 17 course modules that lies flat for ease of study. 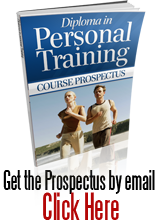 Detailed, practical information that guides you skilfully towards becoming a personal trainer. 13 personal trainer's assignments. Your assignments will be carefully marked with personal advice by an experienced tutor. Self-assessment exercises. They occur throughout the course to help check that you can tackle each type of training. Personal training software to use on your computer. You get a free personal trainer’s website, complete with sample text. Just change the text to suit your needs, upload it to your site, and you’ll have your own website! If you went to a designer, they would charge you at least £385 for this work. And because we know what clients want from a personal trainer's website, the pages are better than what a designer would provide. Click here to learn more about the free personal trainer’s website. An 'Approved Personal Trainer' logo to use on your notepaper and your website. The right to use the post nominal letters Dip. Pers. T. (BC) after your name.